Sagittarius zodiac compatibility with 12 star signs can be described as a frank and truthful relationship without any deceit. Get Sagittarius Compatibility predictions right away for yourself and for your loved ones! Love astrology shows that Sagittarians are pleasant, truthful and playful. Their candidness without tact may get them into trouble. He wants independence and is compassionate to his lovers. Sagittarius is not emotional but frank in love and looks for a mate who is patient and who allows him his space. He is attracted by companions who are gregarious, charming and pleasant. Sagittarius compatibility with Aries, Leo, Libra, and Aquarius and occasionally with Sagittarius with excellent. Sagittarius should avoid Cancer, Scorpio and Capricorn zodiac signs. Aries and Sagittarius in love and have lot of zeal, liveliness and passion. Both like each other’s companionship and the liveliness of the match increases with time. Both support each other in their times of joy and sorrow and enjoy excitement together. Sagittarius and Aries soul mates should respect the freedom of the other person. This Sagittarius compatibility is of a very high order. Aries woman and Sagittarius man love funny side of life and look for stimulating experiences. Both are impulsive. Sagittarius male is straightforward and will not tolerate any mistake and does not mind expressing his displeasure. But for this, there is very good bonding in the love match. In the Aries and Sagittarius sexual compatibility, both have strong physical passion and magnificent bonding. Aries man with his charisma and buoyant nature keeps his mate in good humor and both have a life full of fun. Their liking for exploration and thrills makes the match inspiring and enduring. Zodiac compatibility between the two is highly blissful. Sagittarius likes socializing and going outside while Taurus enjoys the coziness of home watching a film or reading a novel. Taurus should stabilize the rashness of Sagittarius personality by his intelligence. They should try to support each other rather than work towards the transformation of the other. The Sagittarius compatibility is quite good in this match. Sagittarius man draws Taurus woman towards him by his extrovert and passionate nature. He is also bold and talkative. The Taurean looks for safety in the match but unfortunately Sagittarian goes after every girl. The Sagittarius compatibility might not good in the partnership. Taurus man is rough and Sagittarius woman is shy by nature. The partnership is good in business ventures. Taurus man forces Sagittarius woman to toe his decisions. The match between the two is not very good in matters of affection. Sagittarius and Gemini are restive and tend to argue. Attachment to a place or individual for long is difficult for them. Sagittarius wants to engage himself for a worthwhile venture but Gemini does not waste his energy on such things. Gemini accepts realities of life whereas Sagittarius has a philosophical approach. Love compatibility is quite possible as both have a flexible attitude towards their love relationship. Sagittarius dating a Gemini woman are intelligent and indulge in meaningful dialogue. Both love fun and are gregarious. Gemini woman has a good power of visualization which will be encouraged by Sagittarius man. Problems expected in the relationship are the absence of display of affection and the flirting nature of Gemini woman. Sagittarius woman and Gemini man are initially attracted by their sociable nature and free spirit. There is strong physical bonding between the two and they like to explore new things. Love compatibility runs into bad weather because of the logical approach of Gemini man. Both will be cynical when they lose their temper. In this Sagittarius relationship one is uncomplicated and intelligent while the crab is weak and sympathetic. Sagittarius is frank and unable to comprehend the emotions of Cancer. Cancer is kept happy and reassured by the wit and openness of Sagittarius. Cancer zodiac sign is homebound while Sagittarius likes travel and exploration. This Sagittarius friendship can be converted into a blissful one with both Sagittarius man and Cancer woman putting in some hard work. Sagittarius man has to be dependable and has to take more interest in family matters. Cancer woman should be bolder and participate in the actions of Sagittarius man. The Sagittarius marriage with a Cancer man is probable but not unworkable. For this Cancer man should invest his time in the activities of Sagittarius woman and Sagittarius woman should shower him and his family with warmth and friendliness. Sagittarius and Leo sun sign enjoy an ideal relationship. There is romance in the love match. Both like excitement, liberty and social events. Minor hiccups in astrology compatibility may result because of flirting by Sagittarius and suspicion of Leo. Envious nature of Leo may hinder the freedom of Sagittarius. Horoscope compatibility is enhanced by the zeal and passion of Sagittarius man which is also common to Leo woman. They enjoy life to the fullest with their fun loving nature. Leo woman has to control the flirting nature of Sagittarius man. This Sagittarius in love with the Lion has fantastic physical bonding. There is harmony in this Sagittarius compatibility as the couple has many common traits. Sagittarius female and Leo man want to be in the glare of public always. With good understanding between them, they enjoy their romance throughout their life. With time, the compatibility between the two grows deeper and stronger. Sagittarius zodiac sign is emotional, capricious and juvenile in matters of love while Virgo has a complete and wide view of the situation. Sagittarius is highly confused by nature and will be subjected to constant nagging by the Virgo. Compatibility is possible to some extent if they appreciate each other’s point of view and forgive the mistakes of the other person. Sagittarius man is always attracted by girls and tends to flirt with them. His haughtiness will irritate the realistic and sober Virgo woman. This Sagittarius compatibility is difficult to achieve as they have opposing natures. This love match may survive if Virgo woman does not try to dominate him and if she can accept his mindset. Sagittarius woman is an extrovert who wants to live life fully while Virgo man is a serious person with a realistic attitude towards it. Virgo man is put off by her outgoing nature. This Sagittarius marriage compatibility is short lived unless lots of compromises are made on basic issues. Sagittarius is undemanding, childlike and outgoing by nature. He is clever and loves entertainment. Libra loves stability and agreement in life. Moods of Libra swing from joy to sorrow from time to time. Sagittarius sustains Libra in maintaining harmony all the time but cannot give any ideas for the same. There is wonderful bond between Sagittarius and Libra. Sagittarius man expresses his feelings to Libra woman openly. Both are strongly infatuated with each other physically He can change her bad mood by his sweet talk. Libra woman has full faith in Sagittarius man and gives him all the affection he needs to keep him pleased. 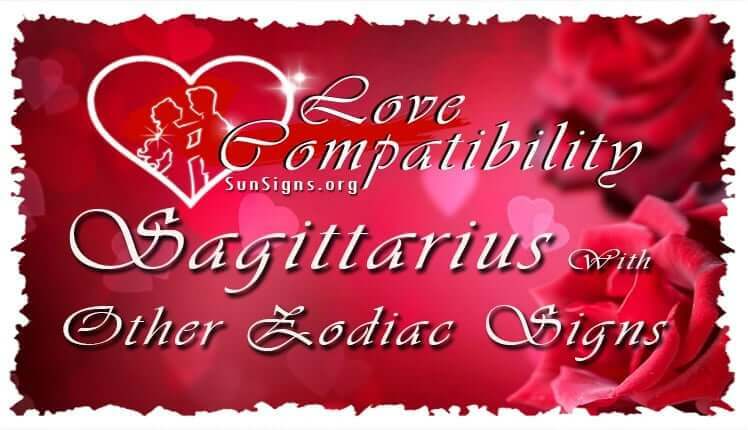 Relationship compatibility of this Sagittarius match is extremely high with fantastic romance and understanding. Sagittarius woman persuades Libra man in achieving great success in life. Libra man fascinates her by his resourcefulness. Libra man is momentarily annoyed by her sharp tongue. The love match enjoys all the love, passion and contentment together. Libra man should be really fortunate to have this Sagittarius lady as his mate. Sagittarius in love with Scorpio is a combination of fire and water. Hence relationship will be thrilling. Sagittarius is energetic, bold and talkative. He makes the life of Scorpio exciting. Scorpio is powerful and motivated. He has lot of passion and devotion in love. Sagittarius is indifferent in relationship while Scorpio star sign is very serious. Sagittarius man is verbal in expressing his love while Scorpio woman is reserved. Scorpio woman is in need of steady and emotional love. Scorpio woman is envious and possessive in love. The relationship is not viable practically. It will encounter problems because of the diverse natures. Sagittarius woman is forthright and liberal and likes the force and grit of Scorpio man. Both enjoy exploration and excitement. The match can be highly compatible and sexually sizzling provided Scorpio man gives her liberty. Scorpio man is demanding and Sagittarius woman should oblige to keep the relationship going. The Sagittarius personality loves pleasure, travel and independence. They are extroverts who enjoy socializing, making new contacts and partying. On the flip side, they are honest and childlike. They will upset others unintentionally by their scathing comments. They should learn to be skillful and discrete to boost their relationship. The Sagittarius Sagittarius compatibility is very high. Both have a liking for pleasure, explorations, social gatherings, and adventure in new locations. In life, they should be more sincere to achieve something worthwhile. They should strive to see that their love for liberty should keep them together and should not separate them. Sagittarius is frank, clever and intolerant. Capricorn is genuine, reticent and impatient. Sagittarius is light hearted and looks for fun in life at every moment. Capricorn is trustworthy but loves solitude. The Sea Goat will persuade and supports Sagittarius in his endeavor to succeed in life. Sagittarius is highly communicative and outgoing. Company of Capricorn may not be interesting to Sagittarius. The love compatibility between the two is not attainable as they have entirely different personalities. Though both Sagittarius man and Capricorn woman have devotion and admiration for each other, Sagittarius man has different wants from his mate which she may not be able to satisfy. The relationship may become pointless after sometime and breakup. The love match may endure if Sagittarius man can make her sociable and she can become a supporting partner to make his ventures successful. Sagittarius is an extrovert who loves fun and good company. Capricorn man is reserved, sincere and realistic. Sagittarius woman may not like his unexciting and timid nature. Capricorn man may not like her outgoing and relaxed disposition. Compatibility may not exist between the two. Sagittarius and Aquarius have lot of common traits and hence the compatibility in relationship is only to be expected. Both love to go out, have fun and meet new people. Both are relaxed and look at life on day-to-day basis without becoming emotional. They give each other space and engage in meaningful conversations. Compatibility forecast between Sagittarius man and Aquarius woman is perpetual. There is great understanding between the two. They like diversity in life and strive to complete other’s needs. She will motivate him by her intelligence and he helps her to develop her imagination. They indulge in intelligent dialogues. There is eternal love between the two. There is real affection and bliss in the love match of Sagittarius woman and the Water Bearer. Both are drawn towards each other but still retain their independence. Both have zeal and zing in life. They love each other passionately but still are not dependent on each other. The Sagittarius compatibility predictions are heavenly between the two. Sagittarius and Pisces star sign are jovial and romantic people. In love, their imagination runs wild. Their compassion and concern for others gets them many contacts. With some minor adjustments, they can build good compatibility in love. Sagittarius man is not trustworthy in relationship and this will make Pisces woman to doubt his actions. She is overprotective about the relationship which will suffocate him. There is good sexual relations between the two. In spite of the differences, compatibility is good for this pair. Sagittarius woman is not capable of supporting him when he is in trouble. On the other hand Pisces man tries to be protective and will not allow her to be free. Sagittarius woman will try to understand his shy nature and in the process she may upset him. This may endanger the partnership. Lot of tolerance is required to maintain this relationship with the Fish.